Food Wishes Video Recipes: Got the Monday Blues? Cheer Up…I’m Making Brussel Sprouts! Got the Monday Blues? Cheer Up…I’m Making Brussel Sprouts! Why am I showing this classic fall/winter vegetable (that everyone hates, btw) in spring? Good question…It’s yet another clip that I just converted from the old blog and want archived here for your viewing pleasure. Besides, since it is Monday I thought I could slip this one in early before the “real” clip appears later. I’ll be posting a brand new spring Asparagus recipe that’s so simple and delicious it will make you forget all about Brussel Sprouts, and what you did, or did not do, this weekend. All kidding aside, these are really delicious Brussel Sprouts…believe it or not. As you'll see, the secret is the super fast cooking time and the slicing method. Seriously, this could be your new favorite veggie. Like most people I hated Brussel Sprouts, until I had them prepared in the style you are about to watch in the video. This preparation is so different than any other recipe I’ve seen for these tiny green cabbages, that I really hope you’ll give it a try – when and if you get some Brussel Sprouts. Anyway, enjoy, and stay tuned for another “fresh” clip later. 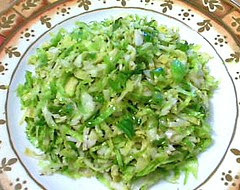 And yes I hate brussel sprouts, but that dont look too bad..maybe ill try it. Quite tasty. Now I must trick guests into eating it! I thought I'd give these a try - of course I pretty much believe "pork fat rules" - so I used rendered bacon fat instead of olive oil/butter. Added thin slivers of ginger to the mix and followed the remainder of the recipe. Delicious! As always, thank you for sharing...AP. I love all veggies & will try this...maybe with ginger too. This is really a great way to prepare brussel sprouts. I made them several times and I usually add some honey for sweetness and season with nutmeg. Thanks for sharing this.